If the intro feels heavy-handed, maybe it's because the Juggernaut's doing it. That's right, the first voice on Introducing Joss Stone comes not from the singer but from tough-guy actor Vinnie Jones. And he can't wait to tell you that this album is all about change, dispensing such pearls of wisdom as "although the players change / the song remains the same" and "you gotta have the balls to change." Thanks, dude. See you in "X:4." Now where's Joss Stone? Oh, there she is: covered in body paint, ostensibly naked, writhing against a brick wall. It's safe to say Stone has spent some time updating her image since 2004's Mind, Body & Soul. She's also done a lot of growing. She's made some mistakes ("What Were We Thinking"), caught the touring blues ("Arms of My Baby"), lost someone she cared about ("Bruised But Not Broken") and fallen in love several times. Vocally, she seems to be reinventing herself as Mariah Lite. Diva squeals show up all over the assertive, turntable-tasting "Put Your Hands on Me." Such straining makes the smoothness of "Fell in Love with a Boy," from 2003's The Soul Sessions, even more appreciated in retrospect. Stone handles the mellow songs better. On "Tell Me What We're Gonna Do Now," she settles into a comfortable groove and leaves it sunny-side up for Common, who contributes his winning positivity: "When we combine it's like good food / and wine / flavorful yet refined." The Lauren Hill-abetted "Music" comes off best, though. Stone, cruising along in midrange over a thick beat, harmonizes with the backing vocals in a way that recalls Destiny's Child. And that's an interesting coincidence, seeing as how Mariah Carey looked a lot like Beyoncé on the cover of her comeback album, 2005's The Emancipation of Mimi. Stone's inner diva re-emerges to finish off "Arms of My Baby" with extra melisma. Then she encores on the funky "Bad Habit" --- a song that would've fit in nicely with the uptempo material from Carey's 1991 debut --- before full-on commandeering the hook from Donna Summer's "Love to Love You Baby." But she's not done yet. "What Were We Thinking" opens with oversinging that approaches "American Idol" territory. Carey can get away with similar things because she has The Voice. Having five octaves to work with is practically a license to go overboard, because even the crashes will be spectacular. Stone does not have The Voice. She forces her vocals to go where they can't. 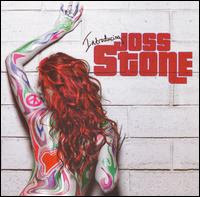 She's so focused on reintroducing herself to the public as Joss Stone, Diva Supreme, that she sometimes loses sight of her strengths. In her efforts to change, she simply tries too hard. Couldn't she just call herself Mimi or something? These last two reviews are ridiculously accurate. Question: do you buy all these albums? I would be bummed to end up with a collection of albums at the end of every year that I only considered 5s or 6s. At this point, a lot of the CDs I review come from the library. That's why many of my reviews show up a month or two after an album's release date. I've found that, for many people who read about music, that month isn't a deal breaker. This works well with my methodology. In general, I prefer to give myself time to really understand an album rather than to dash off a review, as so many publications do, in an attempt to be first. Also, I feel it's important for my growth as a reviewer to not restrict myself to what I would buy in a record store. getting familiarity every day by reading such pleasant articles or reviews. Hi there, this weekend is nice in support of me, as this moment i am reading this great informative paragraph here at my home.